The St Helena Independent was St Helena’s first ever online Newspaper. The St Helena Independent became the first privately run newspaper to be a success on island. Produced by the team at what was then Saint FM, the newspaper has been in operation since 11th November 2005 and has developed from a limited 11 page E-newspaper to a widely read printed paper expanding to 40+ pages. In his editorial in the inaugural issue, Station Manager of what was then Saint FM and now also editor of the St Helena Independent wrote: “For any media organisation, it is important to be able to stand on its own two feet and not lean on any single organisation for its survival. Every newspaper or Radio Station has got sponsors and advertisers for its survival but one single sponsor or advertiser should not be so important that the editorial freedom is put in jeopardy. The Saint Helena Media Productions ran Saint FM with great success and the Island has experienced a completely new sound on the airwaves – FM radio. The world has become more aware of St Helena through internet radio, which has had 43,000 listeners in it’s first six months of being established. It has all been done without expensive consultants or overseas expertise to great expense to the taxpayer. With a little enthusiasm a lot can be achieved.” And a lot has since been achieved the St Helena Independent, or ‘Indy’ as some prefer to call it has developed from strength to strength. 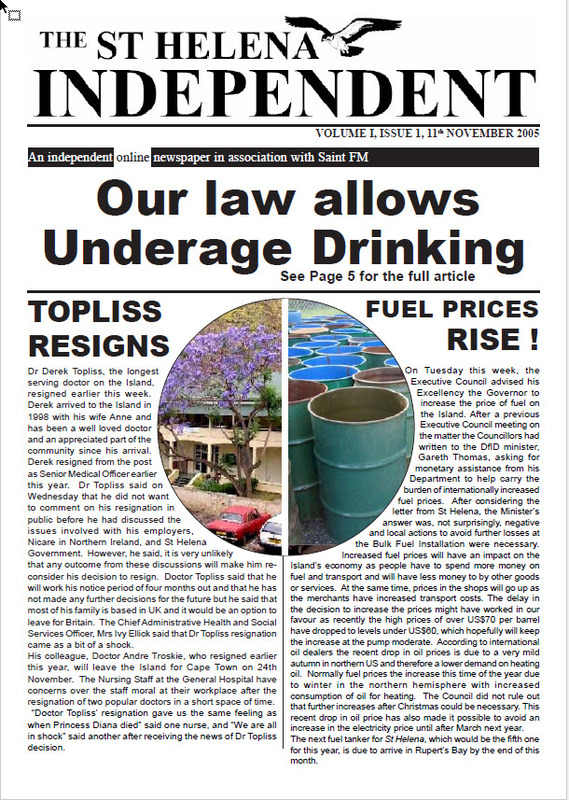 Just twelve editions later and the popularity of the online newspaper proved was such a success that the we went into print starting off with just 100 copies on 27th January 2006. At first it was felt that maybe having two newspaper on such a small island would prove to be unprofitable, but with each week that passes the Independent has grown and become more successful than ever envisioned, now distributing to 27 outlets around the island with sale of over 1000 copies each week, whilst still remaining free for download to the world wide web community. Between 1500 – 2000 people download the Independent each week.